The excursion is devoted to acquaintance with a very interesting corner of the Byelorussian Poozerie. 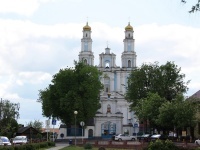 This is the northern part of the Minsk region - Myadelshchyna, where an old village is located, in the past Budslau town with its sanctuary - the Church of the Assumption of the Blessed Virgin Mary, and the southern part of Vitebsk region - Glubochcina with its many sights - monuments of history and architecture of the 17th-19th centuries. The community of the church, disproportionate to the scale of the former village, and now of the usual village, immediately captures the attention of every guest. The church will force everyone to throw aside everything that he was busy on the road before his gaze met this fascinating stone block. Obviously, this was the psychological calculation of the Bernardine fathers, who built their residence here in the second half of the eighteenth century, in order to make "I will praise" from it, where Budslav went from. In 1613 a miraculous icon of the Mother of God appeared here and the place became a real center of pilgrimage. In 1767-1783, in connection with the increase in the number of pilgrims who arrived in Budslav, the Bernardine fathers unfold here the grandiose construction of a new church that was eight times larger than the old one and was consecrated in the name of the Ascension of the Blessed Virgin Mary. To bow to the miraculous image and appreciate the interiors of the legendary church you will be able to during this excursion. The historical part of the city of Glubokoe forms a picturesque silhouette of the monastic complex, which includes the building of the former church, monastery and brama. The Carmelite church in Glubokoe is perhaps the first materialized example of the "Vilna" baroque style in Belarus. July 18, 1812, Napoleon stopped at the monastery. After staying in the Deep 10 days, the French emperor, in order to thank the Carmelites for his hospitality, ordered one of his courtiers to bring a whole dish of coins of Napoleons as a gift to the abbot of the monastery and expressed to him his admiration for the beauty of the monastery and its environs. We invite you to be inspired by local beauties. The church involuntarily attracts everyone's attention with its openwork towers. In this place, in 1628, Joseph Korsak laid a wooden church. Located on the mountain, it was clearly visible to the inhabitants of the surrounding villages. During the Thirteen Years' War (1654-1667), when Glubokoe was attacked by Russian troops, the church burnt down, but was rebuilt. In 1764, a dilapidated temple was dismantled, and in its place by 1782 a stone church was built in the late Baroque style. Initially intended for circular viewing by its location on a high point of the square, the church is perceived as a stylistically finished sculptural composition. Consistent in a single style of classicism, whether it concerns the exterior or interior of a building, the temple makes a strong impression of the harmony of its calm, strict architectural and decorative forms. Coming out of the church, you find yourself in the inner courtyards where various flowers, bushes, the museum of the Mosar parafia are placed, the exposition of which was collected from the personal belongings of the parishioners of the church and gives a visible impression of the peasant way of life both long ago and very recently. A walk along the park leaves a emotionally bright, memorable image for the visitor. In this you can see for yourself by taking a walk along the path leading to the ponds and the Holy Spring. 10-April-2019 Замечательные планы экскурсий и экскурсоводы. Только просьба экскурсовода предупреждать заранее о СЛОЖНОМ подъеме на колокольню (г. ГЛУБОКОЕ), т. к. он не оборудован поручнями, ссадины на руках, царапины на обуви и грязные вещи. Возможно, ситуация в скором времени на данном объекте улучшится. 29-August-2018 Хорошее изложение материала, внимательность. Поехала бы на другую экскурсию. 19-July-2017 При планировании поездки в Минск искала в интернете информацию о бронировании экскурсии. Нашла ваш сайт. Купила тур. Уровень общения со специалистами хороший! Экскурсоводом был Якуб. Колоритный сябар. По теме экскурсии все достаточно грамотно. Но не хватило информации по трассе. Ни слова лишнего. 10-July-2016 К сожалению, не запомнила имя, но наш экскурсовод был великолепен! Одна из наших подруг, работая учителем, бывала во многих местах. Но с нашим экскурсоводом хотела бы ездить везде, как и мы! Чай во время экскурсии пришелся ко времени удачно!